What an awesome seminar! 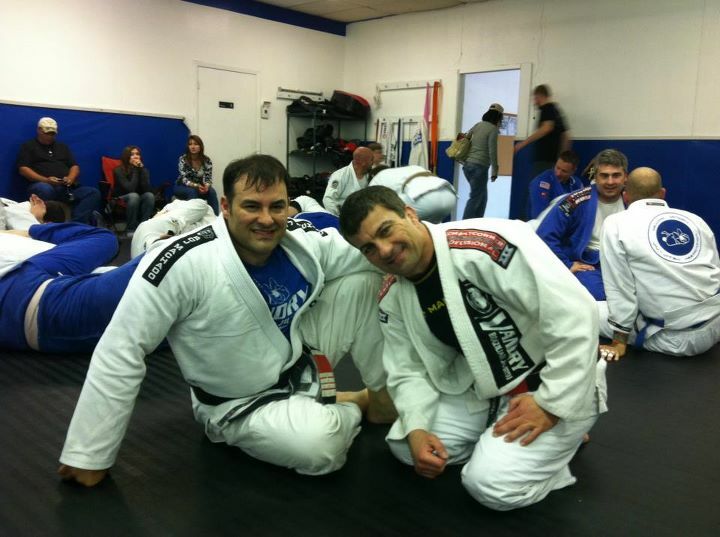 I was able to see a piece of BJJ history in Texas. I saw three American first degree black belts under VBJJA and the Machado bloodline. I was very proud to see Carter Fisk, and Manny Galvan earn the highest and senior rank along with Gary Claxton (RIP) of my entire students in BJJ. These two men have shown that training, developing, sharing, and always remembering your lineage and the responsibilities that go along with it are vital, and a key element in the development of a Black belt. I was very happy to train with my senior Black belts, and the pleasure to train with Galvan and Fisk at the clinic along with Master Carlos Machado on the mat. I believe you should always give respect to your instructor, as I stated at the clinic. My mentor has taught me BJJ, and each time we get to train, I always learn something new, and more ideas to develop until the next time. This precious mentoring I have been privileged to receive for 16 years taught me to give this to my students as well. The importance of this trait is how this was also passed onto my Black belts. They are giving, sharing, and are proper in their behavior and professional martial arts philosophies. I had a great time at the clinic. Each quarterly clinic I always think is the best one, and then there is something special about the next one. Holding onto your creed and mandating yourself to follow the protocols of my philosophy as I do of my instructor’s philosophy is the only way to maintain a belief, a philosophy, an art, and our way of Jiu-jitsu. You have to be a constructive leader that develops your students through the love of Jiu-jitsu, and to see them grow like babies into toddlers, into teens and adults. This precious growing of a student is always something an instructor can be proud of. The special point of this is those students also are selfless, and are giving to other students, never for selfishness, or narcissistic patterns of behavior. I enjoyed training with my mentor, and the new ideas I have to explore and develop. I was ecstatic to train with Galvan and Fisk, and then they got to train with my mentor. My thanks to all, and I wrote this article of the month more to exemplify the philosophy, and to remind all of us what we really are charged with in our responsibility of a student of Jiu-jitsu. To my BJJ black belts with the Machado blood in your veins, thank you for your support, and your philosophies you help me spread, as I help my instructor spread. My thanks to first degree black belts Carter Fisk and Manny Galvan, and to all of my senior Black belts Jeremy Carbone, Matt Serfoss, Rob Furlano, Ed Aiken, Jay Hume and Ted Osborn, and thanks to my new BJJ black belts Martha Galvan, Bryan Evans and Jesus Armas! Each of you take time to post a congratulations to my black belts and gratitude for my instructor! So You Want to be a professional Athlete?